Halloween-time is one of the most fun-filled and creative of all the major holidays, especially for party and special event planners all over the country. We LOVE to be a part of all their exclusive events, parties, productions, trade shows, and everything in between! One of the greatest aspects of renting theatrical stage and event drapery for your “spooky affairs” is getting to use some fantastic drapery that you may only really need to use one time out of the year, but yet still have your stage or gala look absolutely incredible! 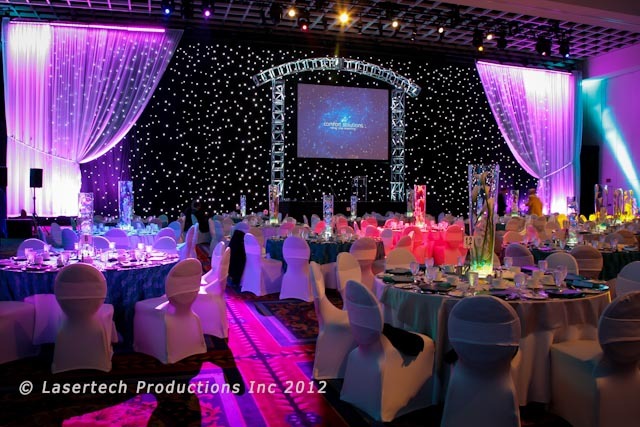 With a huge variety of specialty drapes and décor to choose from, Rent What? can spruce up your Halloween event with a myriad of colorful soft goods to give the design some real “wow” factor. Looking for an extraordinary design, by adding just a single large stage backdrop… but one that will still blow your audience away? Check out our 12’h, 23’h, and 30’h Austrian Draperies (non-operable and operable drapes). They are easy to hang, are a lighting designer’s dream come true, and add some true razzle dazzle to any stage design you might need. 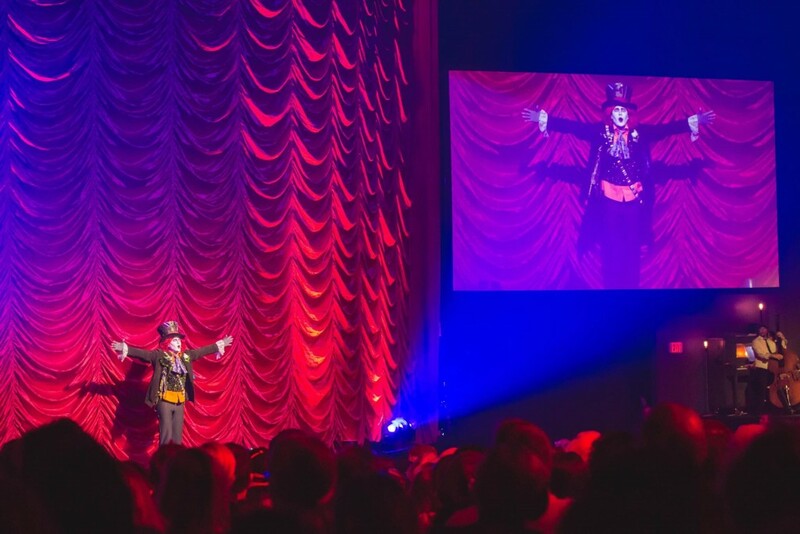 Want to spice up your special event with some scintillating, shadowy figures on stage or even in a smaller, private get-together? Our Pop-Up Shadowbox Kits have it all included in a very low price and can be shipped anywhere in the country—and will give you this incredible effect anywhere you have 8 square feet of space! Dress them up with some pleated legs or swags from any of our other rental drapery collections surrounding them, and be ready to completely captivate your audience. Do you have your stage design already figured out, but are looking for a little extra something special to help enhance the overall appearance? 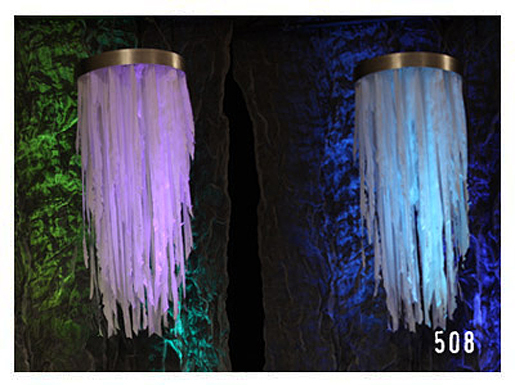 Why not add some of our silky Gothic Chandeliers from our Oh So Swanky! rental drapery collection to your event? These textured, gorgeous embellishments will add an ethereal quality to any stage design—hang them in front of drapes in our Delightably White rental collection for a more charming look, or mix them with metal mesh drapes in our Industrial Textures collection and have a much more mysterious, ghostly feel. Adding rental drapery elements and stage décor to your special event will give it that special touch that will remain memorable long after the party is over! Contact one of our representatives today, and have these gorgeous draperies for YOUR special Halloween shindig, or any other special event you have coming up. With the holiday season (shockingly!) 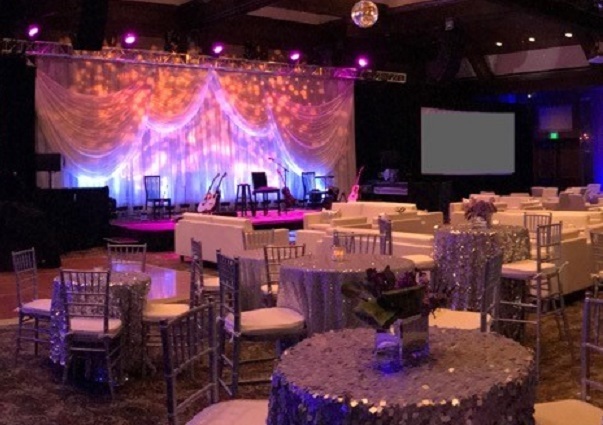 right around the corner once again, we are being called upon to help our clients create dazzling, versatile, and most of all, memorable event designs using our gorgeous rental theatrical stage drapes. The popular direction to typically go with these designs is to use some of our rich and luxurious White, Gold, or Red Supervel Pleated draperies, or perhaps even our White Voile and Classic or Chameleon Stardrop LED curtains, too. These drapery choices are wonderful, and would absolutely help you make a truly elegant stage for your special event. 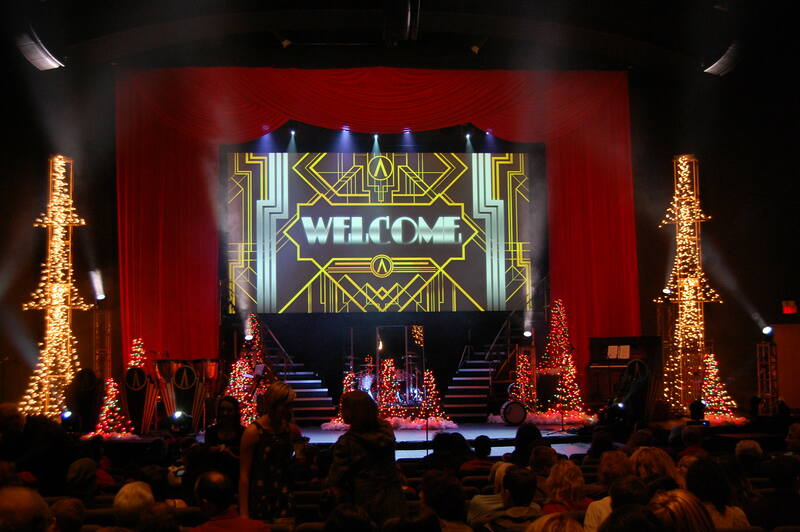 However, let us suggest that you and your production team think a little outside the box while creating the look for this year’s big holiday-themed parties, concerts, and other special shindigs—by blending in some of our genuinely breathtaking theatrical drapes from our Industrial Textures Rental Drapery Collection, too. 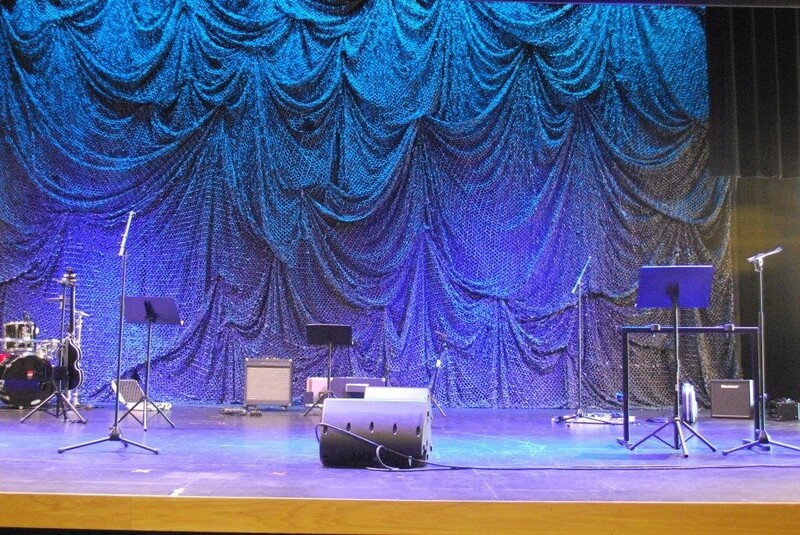 Our Aluminum Metal Mesh backdrops, legs, and borders are incredibly dynamic–by simply adding a splash of some colorful stage lighting you can completely change the mood and feel of the stage design from set to set, making them IDEAL stage pieces for venues featuring a wide-ranging group of artists or event themes. Newer to our collection are these eye-catching Camo Legs (at various lengths), which are also extremely modifiable–as you can hang them frontward or backward to give your stage frame an exceptional, textured look. Layer them over our shimmery Silver or Pewter Textura Pleated Legs and you will surely wow your crowd! And don’t forget our jaw-dropping one-of-a-kind Black Chaos Backdrop, which is perfect when you want a multi-dimensional, layered look created with a single, easy to hang drape. 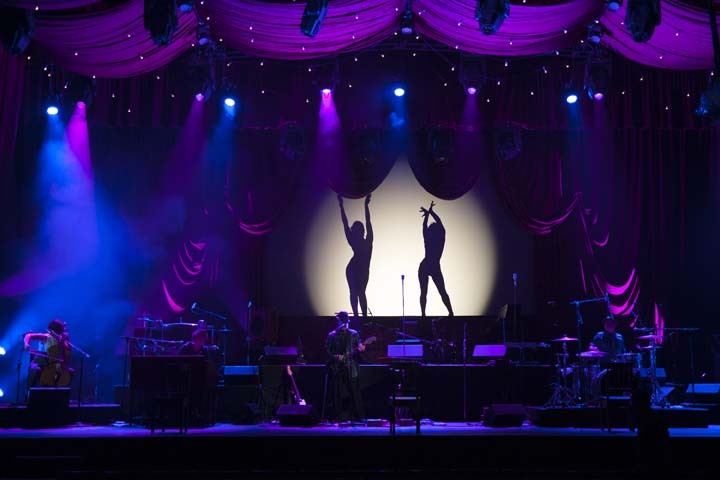 Hang it as the main stage drape behind your band, or as a focal piece at your special holiday event, and just throw some theatrical lighting on it to help set your event’s own distinctive motif. Let our team of experts help you find the most perfect combination of fabulous rental stage draperies for your upcoming holiday soirees, and help you create a completely exclusive look for your special holiday event. 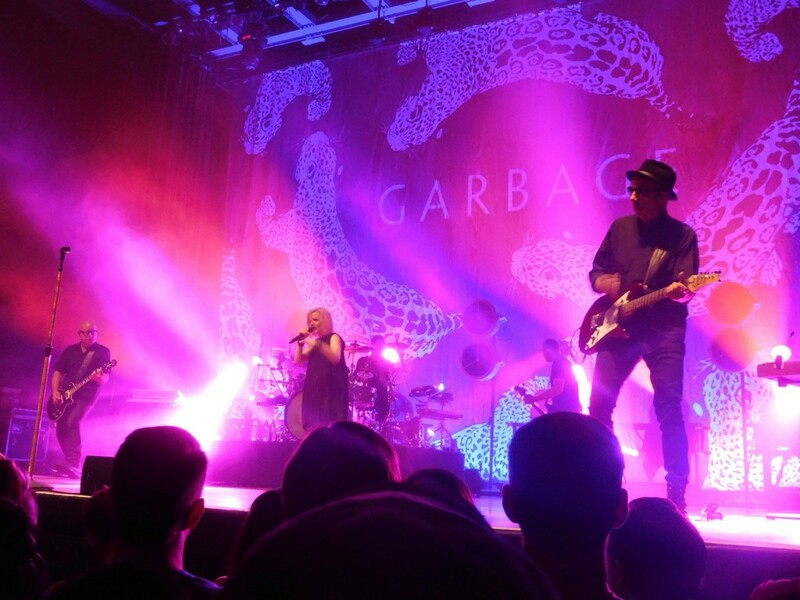 Popular American rock band Garbage is well known for their alternative rock music. Breaking into the mainstream music arena out of the grunge styles of the early 90’s, they continue to tour, offering audiences an alternative and industrial rock show filled with passionate performances and visually dynamic staging. Sew What? Inc has supplied backdrops for the band for several tours now. The two most recent tours both offering opportunity to create unique one-of-a-kind specialty drapery for the band. 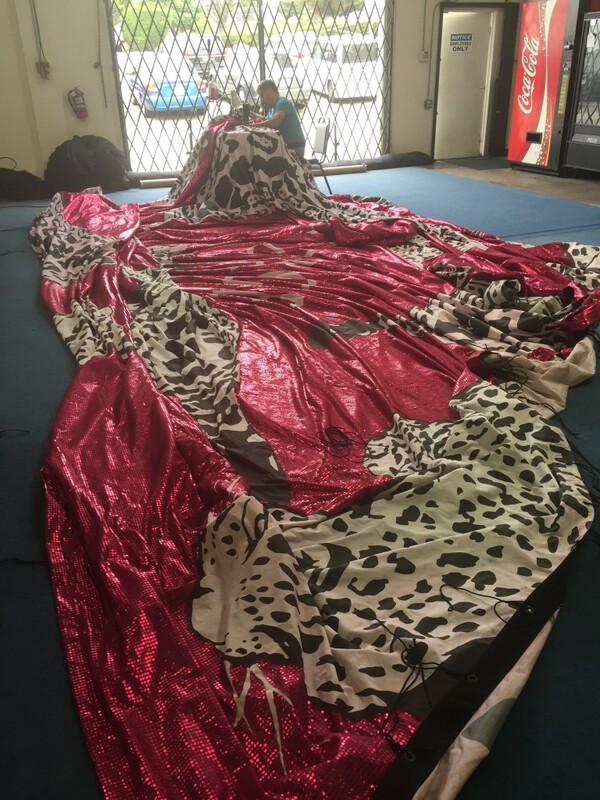 For this dynamic shimmer pink tiger backdrop, we had the challenge of combining multiply layers of cloth, along with graphic elements via our wide format printer. We started with a digitally printed Heavy Knit backdrop, with the tiger graphics printed in heavy saturated black ink. The band name Garbage was printed as an outline, so that we would be able to use the guidelines for later cutting away the surface area applique cloth. The artist wanted to offer the audience the fascination of the femme, glimmer shimmery hot pink of the background, with the stark contrast of the black and white tigers in their pouncing poses. Shimmer mylar dot fabric in fuchsia was selected for the project as it gives a solid bold hot pink that is super reflective. It has a disco ball effect under direct lighting conditions. 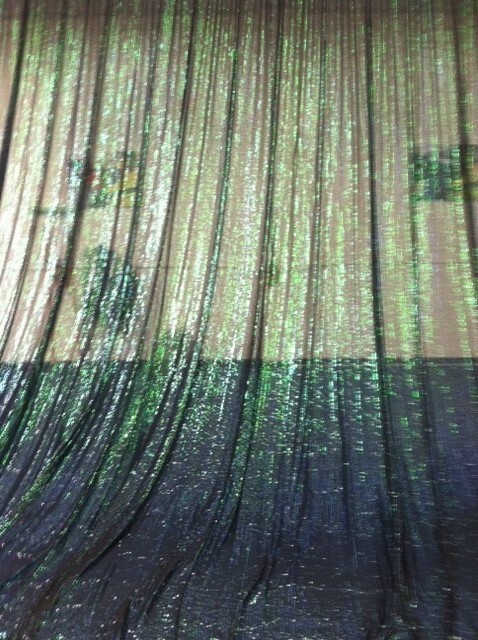 For another contrasting look for their summer outdoor festival shows, we enjoyed crafting a pleated “shimmer scrim” in black and blue/green tones for the band. This is such a unique textile! 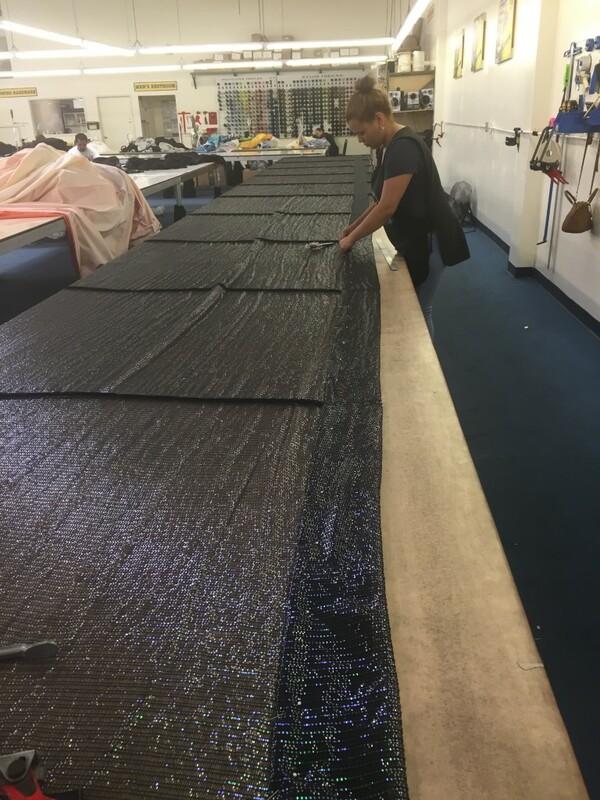 It behaves like a real sharkstooth scrim with both front and back lighting effects – as well as bringing a shimmery glimmer of iridescence due to the mylar threads that are woven into the cloth. 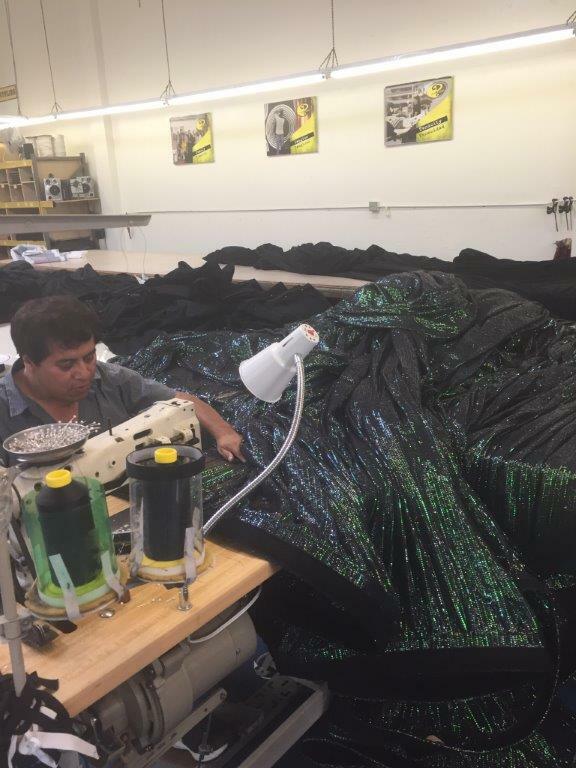 In this shop photo, you see just how unique the cloth is – it almost gives an “underwater” effect. Quite dramatic! Want to know more about what we do and who we are? Sew What? Inc. has a fascinating Company History, and is proud of the wide variety of theatrical venues and many designs that we’ve manufactured over the years. To view some of our notable theater curtain designs, check out our drapery portfolio. Sometimes our clients have special events involving hugely popular actors, authors, singers, bands, or the like, but are having it in a more intimate venue that doesn’t have quite the same size stage dimensions as some of the larger stages that they might be normally accustomed to. Luckily, Rent What? 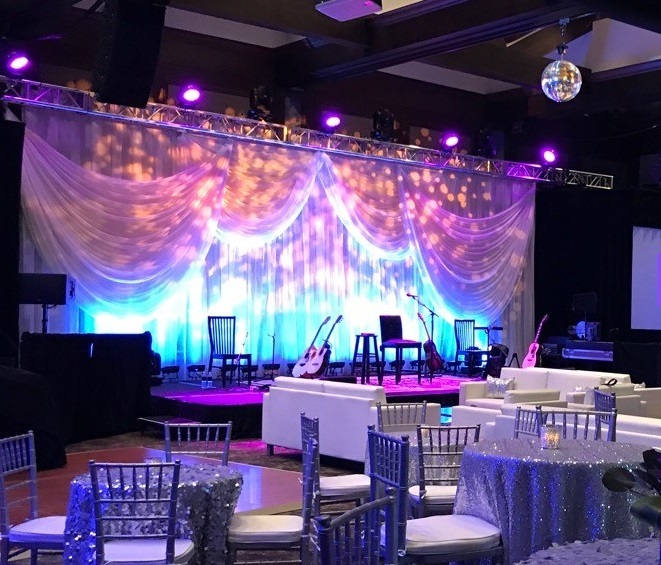 Inc. has a wide variety of incredibly gorgeous and versatile rental stage draperies available to be picked up, delivered, or shipped almost anywhere in the country, and are immediately ready to install and enhance your stage’s design–right out of the hamper! Recently we were able to work with the exceptionally creative project manager Scott LeGrand over at special event experts Brite Ideas. 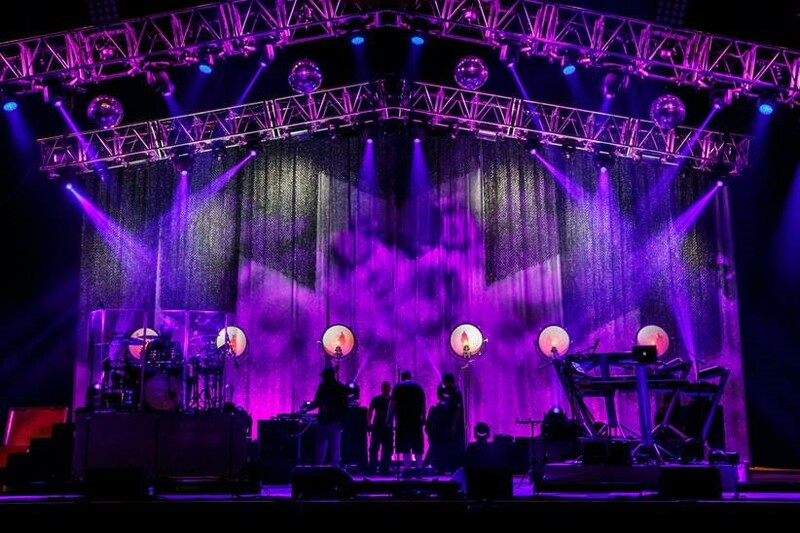 He came to us to help provide him with some gorgeous and ethereal stage drapes for a high-profile corporate event he had coming up soon with the team at the highly regarded GR Live in Grand Rapids, Michigan. He needed something for a “smaller than average” stage, yet he still wanted to provide his clients with a superb and memorable stage design. Offering them a mix of curtains from our Delightably White Rental Drapery Collection did the trick! These versatile White Voile Pre-Pleated Legs and Swagettes are the ultimate definition of “translucent beauty,” offering a soft, delicate ambiance to the event’s overall feel. The stage’s look could also be easily modified by simply adding some colorful theatrical stage lighting for various parts of the show. 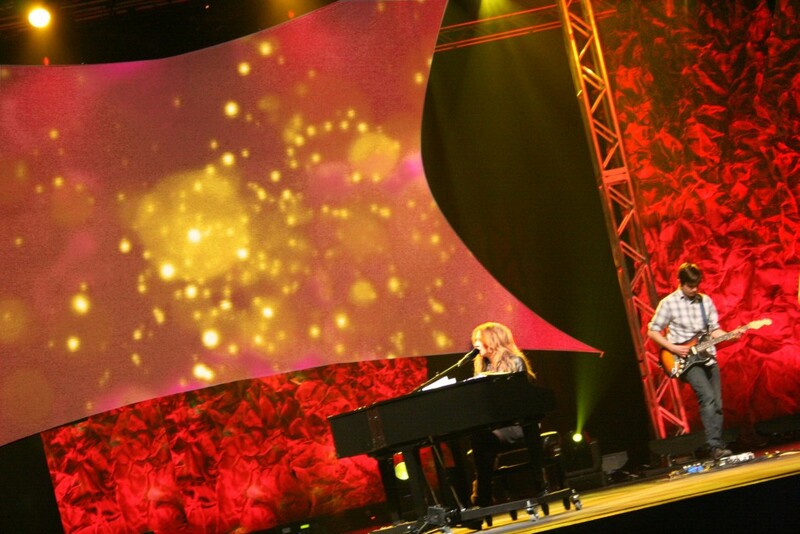 As you can see by these photos that Brite Ideas supplied to us, the staging turned out absolutely stunning!! 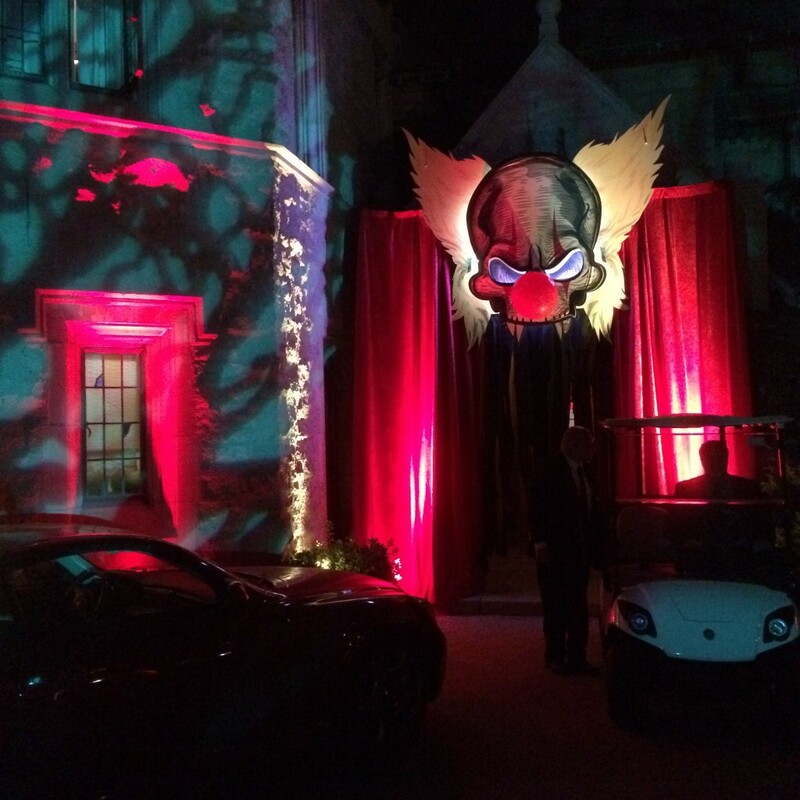 They really did an amazing job with this special event’s unique design, and we were so pleased to have provided them some captivating rental draperies to help complete the look. Let our team of drapery experts help you create the perfect mood for your special event or production, too!